Yesterday, John Leahy, Airbus COO Customers, unveiled at a press conference in London the new figures of the 2012-31 Airbus’ Global Market Forecast (GMF, PDF 5.6MB). The last two years, I already published comparisons of both Airbus’ and Boeing’s forecasts (Current Market Outlook, CMO, PDF 3.0MB). You can find below the update of such comparison with the latest released figures from both companies. Comparison of Airbus GMF and Boeing CMO 2012-2031. Boeing sees demand for 14% more passenger aircraft (excluding regional a/c) with a 19% more value (including freighters). Boeing continues to play down A380 niche potential (56% less a/c than Airbus’ GMF), though for second year in a row it has slightly increased its Very Large market forecast, this time by 20 a/c, or 3.5%. On the other hand, Boeing forecasts about 200 twin-aisle and 4,200 single-aisle more than Airbus, clearly pointing to its point-to-point strategy versus the connecting mega-cities rationale presented by Airbus. In terms of RPKs (“revenue passenger kilometer”), that is, the number of paying passenger by the distance they are transported, they see a similar future: Airbus forecasts for 2031 ~12.8 RPKs (in trillion) (a ~4% increase vs last year GMF) while Boeing forecasts 13.8 (also increased about 3%). Both manufacturers have increased their passenger aircraft forecast in about 500 a/c, less dramatically than last year’s change. In the case of Airbus it has increased the single aisle segment, probably reflecting the success of the A320neo launch. In the case of Boeing, they decreased both single aisle (130 a/c) and small twin aisle (300 a/c), but increased the intermediate twin-aisle in 900 a/c… selling internally a new version of the 777? Both manufacturers have increased the value of RPKs in 2031. Both manufacturers have increased the volume (trn$) of the market in this 20 years, 12% Airbus (to 3.7trn$) and 10% Boeing (to 4.4trn$). Passenger world traffic (RPK) will continue to grow about 4.7% per year (5.0% according to Boeing). This is, doubling every ~15-20 years. Today there are about 15,500 passenger aircraft around the world, this number will more than double in the next 20 years to above 32,500 a/c in 2031. The A380 market equation: Urbanisation + Mega-cities + Wealth = VLAs (Very Large Aircraft, i.e. A380 and B747). Emissions of aviation industry amount to 2% of man-made CO2 emissions. Centre of gravity of world travel will have moved from the Atlantic Ocean (in 1971) to the Middle East (2031). A key driver here is the propensity to fly of the people as the economies of their countries grow. This is captured well by the graphic below, a classic in the industry. This time, Airbus mentioned in the GMF that it has carried out a survey during summer asking 10,000 people around the world whether they expected to fly more in the future. This was true especially in China and India. 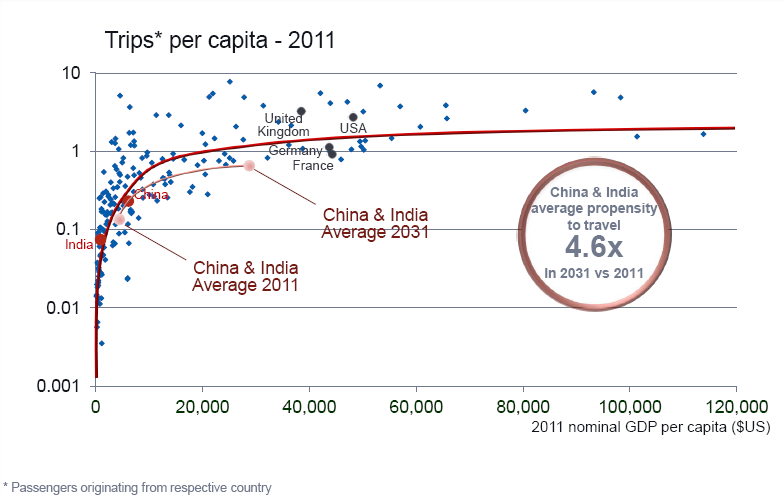 Trips per capita vs. GDP per capita (source: Airbus GMF). Again, I strongly recommend both documents (GMF and CMO) which, differences apart, provide a wealth of information of market dynamics. The complete book from Airbus will be published online next week according to Chris Emerson (SVP for Future Programmes & Market Strategy).